With the new privacy settings updates that are rolling out this week there are a couple glitches. Currently people's posts are being set to 'only me'. You need to manually change this before anyone will be able to see your status updates or game posts. I'm confident facebook will fix this soon, but until then here's how to do it. READ MORE HERE about facebook's updated privacy settings. For each post make sure you select friends only. Step 1 Click on the 'whats on your mind?' status bar on your profile or news feed. The tool bar pops up. When you hover your mouse over the lock, notice that it is set to 'Only me'. Step 2 Click on the lock and select 'Custom' and click 'Edit'. 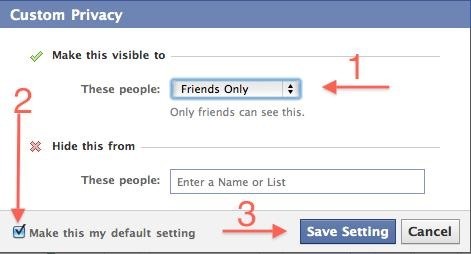 Step 3 Select 'friends only' from the drop down menu. **You can also select 'Specific People...' and set it to a list you've set up. But remember this will change your settings for all future statuses, links, and application posts! I recommend just choosing 'friends only'. 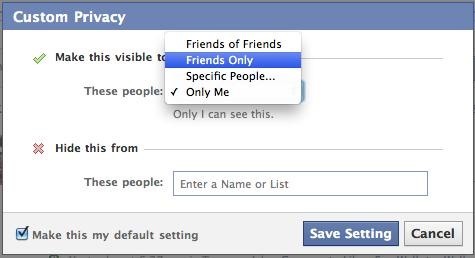 You can manually change it to a specific list whenever you want something to be seen by only farmville players, friends, coworkers, family, etc. Step 4 Select 'Make this my default setting' and click the 'Save Settings' button. Step 5 You're done!! Share this post with your friends so you can see their posts! Make sure you hover your mouse over the lock each time before you share anything to ensure it is set so your friends can see it! This fix works, but it's going back and forth between 'only me' and 'friends only' on my posts. If you've already published some things you can salvage them by going to your profile page, right clicking on the link or picture, and copying the link address/location. Then paste it into your status bar, check your settings and share! Check us out on our facebook page and share with your friends! HELP! how do I STOP automatic posts from being sent on Farmville? A box popped up and gave me no choice but to say "ok: and I want to MANUALLY customize any posts that go out on my facebook page! PLEASE PLEASE HELP! Under Apps And Websites, Click on "Edit your settings"
Under Apps You Use, Click on "Edit Settings"
For "Post to my Wall," Click on "Remove"
Yes but that option is not available. now it says "see who receives posts that this app automatically sends on your behalf." Please help.